Shortlisted Storylines Tom Fitzgibbon Award 2006. The idea for Ella and Ob was bumping around in my head for a long time before I wrote it down. New ideas kept popping up and attaching themselves to my first idea – about a ghost with attitude – so in the end, what was in my head looked more like a bundle of vacuum cleaner fluff than a story line. But I still wanted to write it. When I finally sat down to write the story I did it really quickly. There was a competition coming up that I wanted to enter the story in, but the deadline was only two weeks away. Needless to say, the story didn't win the competition, but it was a runner up, which gave me hope. After that, I did lots more work on the story and many, many people read it, including a class of school children, and helped me along with their feedback. 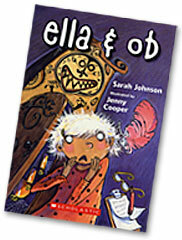 I was over the moon when Ella and Ob was accepted for publication, and Jenny Cooper's illustrations made the story even funnier. The book has continued to bring me much fun and enjoyment as I read it at schools, festivals and libraries, and talk to people about writing and reading all over the country. A bump in the night was no odd thing. It could have been the cat chasing a snaggle-toothed rat, a flurry of whiskers, tails and claws; or the milkman plonking his bottles on the porch; or the tree out the back knocking at the eaves in the wind. Or ... in the not-too-distant past, before she disappeared ... it could have been Bella's mother going through the neighbours' rubbish when she thought they were asleep. In which case the bumps would be accompanied by glad cries of, "Look at this, I found one!" and "Ah-ha, I knew it! A number seven." Until Bella's father would call out, "Do come back to bed, dear, it's four o'clock in the morning. I'm sure, if you asked, they'd let you look tomorrow." But this was no ordinary bump. This was the kind of bump that, if you were awake and alone in the house, would make you jump, and yell, "Who’s there?" Bella had been asleep, but this bump made her sit bolt upright in her bed, and stare around the dark room. Because this bump sounded like someone had walked into the grandmother clock. Bella's father had shifted the clock from the lounge that morning, as he could no longer bear to be reminded of time passing. It now stood in the hall outside Bella's bedroom door. There was another bump and this time Bella jumped right out of bed. "Who's there?" she whispered into the darkness. Excerpt, from Chapter 1 of Ella and Ob. 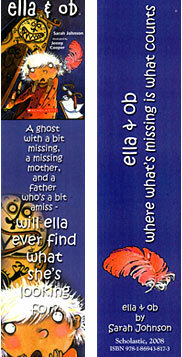 Ella and Ob makes a great book for school visits – especially for years 2 to 6. It's sparked some fantastic discussions at previous visits about story (where it comes from and how we can find and structure it) and building images and characters. It's also an inspirational starting point for kids' own creative work. Ob, in particular, makes a great subject for artwork. Everyone imagines him in a different way. Take a look at the pictures that kids have done for some of my school visits. He must be the most painted boot in history! Owairaka School in Auckland has also written and produced a fantastic play based on the book. Eight talented students performed it at the 2012 Storylines Festival at the Aotea Centre Auckland, and have kindly agreed to share the script. "This is a gorgeous quest-type story about a girl with a lot of oomph and determination who might not be able to save the world but who can save her parents. A great book to read aloud." "A genuinely funny story about ella who goes searching for her missing mother, a recycling researcher, aided and sometimes hindered by the enigmatic ghost, ob. This is one of those special books that would give as much pleasure to the person who reads it aloud as it would to the eager listeners." "Written in a vivid style, with cheerful language and fast-moving action, this book is enticing to young readers who are making the move from picture books to junior novels. Jenny Cooper's charming illustrations add to the comic pleasure." "This is a ghost story with a difference – Bob the ghost (the first B is silent) is only visible as a boot (pink with feathers)... It's a zany story enlivened by Jenny Coopers’ appealing black ink cartoon illustrations. Ghost story fans of about eight to ten will happily rip through this story, picking up the background environmental theme of recycling as they read."